Extreme Faith Camp is an amazing Catholic summer camp experience! 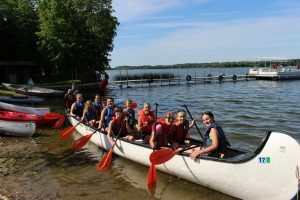 Activities such as: Kayaking, canoeing, paddle-boats, swimming (pool and lakefront), fishing, archery, ropes courses, indoor gym and outdoor courts for basketball, “Wacky Olympics,” arts & crafts, daily mass, Eucharistic adoration, & reconciliation. Drawing closer to Jesus in an exciting week-long experience like no other. For more pictures, visit our pictures page! Grades 9-12 are welcome to come back as leaders! Leaders arrive one day earlier, Sun. July 7, and depart the same day as all campers, Fri July 12 (they also get to go half price!). Pre-registration is open. Just fill out a registration form and turn in to the parish office. Carrie Derkos will contact you. EFC costs $400 per student ($200 for high school leaders, free for adult chaperones). Fundraising can cover up to half the cost, and scholarships are available to supplement if price is the only thing holding someone back. Our fundraisers start the last weekend in January. We are in need of adults to come on this trip to chaperone and be in charge of small groups of middle schoolers. It’s free for adults, think about if you can take the time to join us! 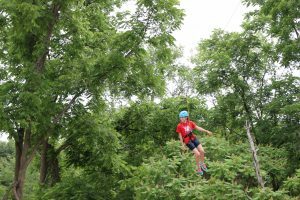 Just an hour west, Camp Courage has more than 300 beautiful wooded acres and lake frontage on Cedar Lake. Extreme Faith Camp has been at these grounds and facilities for 5 years. When we aren’t there, the space is also home to True Friends, a camp serving thousands of kids with disabilities each year.